"Heresy" is a nebulous term for anything that deviates from orthodox or traditional belief. Of course, the problem arises when we ask "What is orthodox belief", or "Who decides what traditional belief is or was?". Even so, there are some categories that can help us not be led astray from, at the very least, our personal and communal integrity. Maine is unusual in that it is the source of several movements that trend toward heresy. The movements in today's sermon are not, in and of themselves, particularly heretical, at least by our modern standards, but they have tendencies in that direction. This is the last sermon in our Different, Yet Related series. I hope you have enjoyed our journey through Christian traditions! Yesterday, we were blessed to share our service with The Miners Creek Band, who play some great bluegrass music. Bluegrass is the appropriate form of music for our discussion of The Pentecostal Movement, which started either in Acts 1 in Jerusalem 2000 years ago or in 1901 in America. Personally, I think both can be true. Since the Pentecostal tradition exploded upon the American scene, it has expanded rapidly around the world. The topic and the great music made for a Spirit-filled day at Rockland Congregational Church. Enjoy the sermon either as a PDF or in audio. The Methodists formed in the mid-1700s as a movement within the Anglican Church in England. Within 100 years it was the largest Christian denomination in the West. The reason why it spread so quickly is primarily because John Wesley, the founder, was an organizational genius and an obsessive record-keeper. In America, the Methodists were on the crest of the expansion into the West, and were on the front end of the abolitionist movement as well. Wesley and the Methodists are a powerful witness to the work of the Holy Spirit in the world. Click above for the sermon, and below for the audio. ​PS - In the audio, I say the reading is Romans 12. It is not - it is Romans 4. We go backwards in time this week to take a look at the radical Reformation through the Anabaptists. Their story includes one of the wildest events of medieval European history - the takeover of Muenster, Germany. Out of that story comes a small but very influential movement in Christianity. Enjoy! PDF link is above, audio is below. The Baptists have a rich tradition that began at the same time as the Puritan and Congregational tradition. Aside from the principle of adult baptism, there is much our tradition shares with the Baptists. The PDF is attached above and the audio is below. This week, our historical overview of different movements in Christianity brings us to our tradition, the Congregationalists. It also brings us to America, which will become a haven for new religious movements as we go forward. The Congregational tradition is very rich and, as a Congregationalist, I have studied the history and theology for years. I am leaving a lot out here, just as I am in other traditions. The main difference here is that I know what I am leaving out. In our other traditions, I don't know always know what I am leaving out. Regardless, I am drawing from a lot of learned knowledge in this sermon. One thing I didn't say in my sermon is that the Congregational way of doing church is very hard. When it works, it works really well; when it doesn't, it really doesn't. But I also believe it is the best of all possible ways to do church in this day and age. I could go on. Enjoy the PDF and audio! The Reformed tradition is primarily influenced by John Calvin, whose Institutes of Christian Religion has been the foundational document for the Reformed, aside from Scripture, since it was completed in 1599, after many revisions and rewrites. Calvin contributed much to the understanding of the Reformation and new ways of doing church, although those who study such things get hung up on the ideas of Election (which Calvin speaks on at length) and Predestination (which Calvin says very little). Calvin, however, was a big proponent of God's grace and how it works in the world. Most of his writing is about that and how we respond to it. In this 500th Anniversary year of the Reformation, to talk about the Reformation without talking about Calvin is to leave at least half the story outside the door. PDF is included this week, and audio is below. This week we examine the Anglican/Episcopal tradition. I believe my Congregationalist tendencies come through strongly in this reflection, so I apologize in advance for any whose affinities trend toward the Anglican and Episcopal tradition. between Protestantism and Catholicism for almost 500 years. We began our series again on the multiplicitous expressions of Christian faith through the ages yesterday by looking at the Lutheran Church and the beginnings of the Protestant Reformation. Martin Luther was a towering intellect and at the forefront of the rapid changes that happened in the early 1500's in Western Christianity. 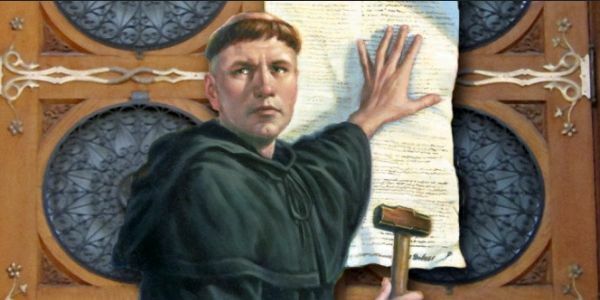 The Reformation was the culmination of several issues, problems, and ideas that were rising up at the time, and Martin Luther had the wherewithal to become the lightning rod for the beginnings of the movement. Next week, we will look at the Anglican/Episcopal tradition. We had audio issues this week, so only the PDF is available this week. I had the privilege, by the good graces of our church, to spend the prior week in Demorest, GA, at the NACCC Annual Meeting. The Bible Lecturer was the inestimable Barbara Brown Taylor, who spoke about Dreaming, Talking, and Acting. Her example was Simon Peter, and she did a magnificent job of discussing who he was and what it means for us. BBT was funny, incisive, and exceptionally well-researched in her presentations. Demorest and the surrounding area is beautiful, nestled in the foothills of the Smokey Mountains, and the people are as friendly as 'they' say. Thank you to Martha Majunka, who preached and led the service last week while I was gone. Our series on different denominations and movements in the Christian tradition will continue next week, when we will discuss the Lutheran Church, and perhaps some Anabaptists as well. I just have audio for you this week. The Orthodox Church is fantastically vast and complex. Every single thing that happens in an Orthodox service (and there are a lot of moving parts) has meaning. Every single part of an Orthodox temple or church has meaning. What is more, that meaning goes way, way back into the hazy, early years of the beginnings of the Christian church. My thoughts here, remember, are from an outsider perspective and any omissions or errors of interpretation are mine alone. As with all the traditions we will be looking at this summer, I seek to reflect the best ideals of what I know about the particular tradition. Audio is the full service and PDF included this week. ​Peace and grace to all! We begin our "Different, Yet Related" series today by looking at the Catholic Church. Each week, we will look at the Worship, Theology, Outreach, Spiritual Disciplines, and Structure of each denomination and movement in the Christian tradition. Because I want to do this by showing each tradition in the best light possible, a lot will be left out. No more so than the Orthodox and Catholic traditions, since they reach back all the way to the beginning. So for those of you who come from those traditions, forgive me the omissions. Enjoy the PDF above and the audio below. "Bearing Witness: Freedom of God, Freedom on Earth"
Pentecost is when we celebrate the arrival of the Holy Spirit upon the disciples. Not only is it the 'birthday' of the church, it is the moment when we become free as God's people. Our relationship with Jesus is about a lot of things, but one thing it is definitely about is our freedom. During the season of Pentecost, at least until the Narrative Lectionary starts again in September, we will be exploring this 'free reign' of the Holy Spirit by looking at the various denominations of the Christian tradition. We will follow them in a relatively historical manner. In the meantime, below is the audio for the sermon for Pentecost.